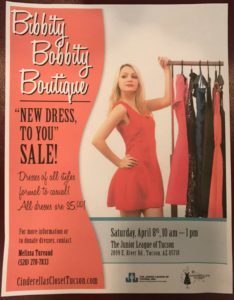 Bibbity Bobbity Boutique “A New Dress to You Sale” | Junior League of Tucson, Inc. The Junior League of Tucson is co-hosting a $5 dress sale to fundraise for Cinderella’s Closet. Cin derella’s Closet is a local nonprofit dedicated to helping Tucson teens in need get outfitted for Prom. They receive hundreds of donated dresses each year. Many of these dresses cannot be used for Prom for various reasons. They are a mix of new and gently used and range in all sizes and styles. We have everything from casual, summer, work, to a night out on the town! All dresses at this sale will sell for $5. All of the money raised will enable Cinderella’s Closet to purchase dresses in the sizes they lack to ensure all girls receive a Prom dress!